Between 60 and 80 per cent of the world’s small-scale farmers are women. They are responsible for growing and harvesting more than half of the food produced annually on earth. The majority of women farmers, however, face multiple forms of discrimination that undermine their capacity as guarantors of food security for their homes. “We know that the role of women is crucial for achieving the Sustainable Development Goals,” said Daniel Gustafson, deputy director-general of FAO. “In this regard, Guatemala is a country with interesting experience and very good results,” he added. The Government of Guatemala has decided to incorporate a gender perspective into its national programmes to support family farming (PAFFEC) and fight malnutrition (ENPDC). “We now face the challenge of mainstreaming gender equality in every one of the Ministry’s programmes and initiatives,” said Felipe Orellana, Guatemalan Deputy Minister of Rural Economic Development. The Guatemalan experience was presented this Wednesday at a side event to the Committee on World Food Security held at the headquarters of the FAO in Rome (Italy). FAO data indicate that if women farmers had the same access as men to productive resources such as land, their crop yields could increase between 20 and 30 per cent. 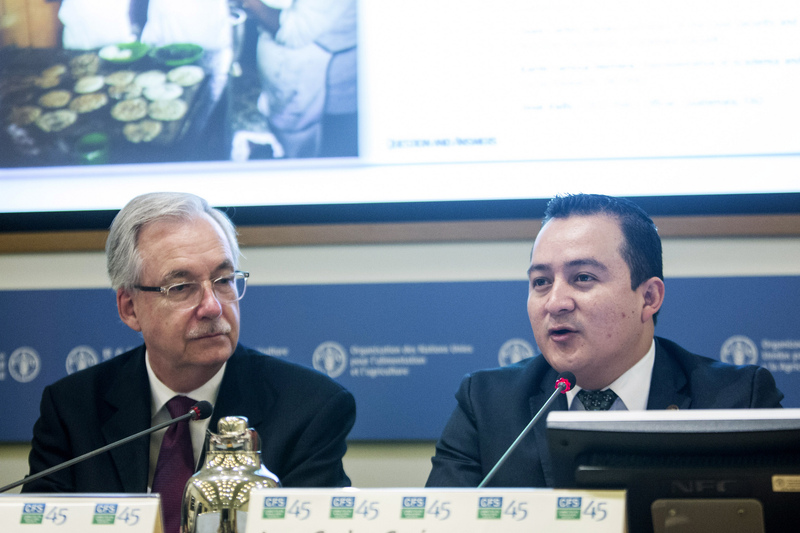 “We need to achieve greater integration to provide more opportunities and rights,” said Juan Carlos Carías, secretary of the Secretariat of Food and Nutrition Security in Guatemala, a country where only 7.8% of landowners are women. “And to do this, institutions need a political mandate to promote equality,” continued Mr Carías to an audience of delegates of United Nations Member States and representatives of various international organisations and agencies, NGOs and the private sector. “Women, especially rural women, need to be fully involved in decision making,” argued Karin Larissa Herrera from INCOPAS, the consultation and social participation body that represents Guatemalan civil society on issues related to the eradication of hunger and other forms of malnutrition. Ricardo Rapallo, a FAO food security officer for Latin America, recalled that 39 million Latin Americans do not have enough to eat and that disaggregated data seem to indicate that it is women who suffer the most. 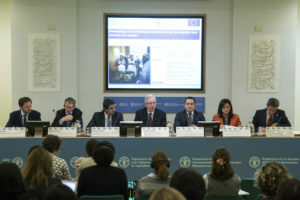 With global hunger figures on the rise in the last two years, panel members highlighted the importance of keeping food and nutrition security at the top of the list of priorities. To achieve sustainable and lasting progress in this area, participants invited the international community to take advantage of the lessons learned in Guatemala and adopt a more holistic focus to integrate gender equality within its policies and programmes. “Empowering women is one of the smartest investments that can be made,” said Willem Olthof, Deputy Head of Unit, Rural Development, Food Security and Nutrition in the European Commission’s Directorate-General for International Cooperation and Development (DG DEVCO). Through their joint FIRST programme, the European Union and FAO are supporting the integration of gender issues into implementation of policies on food security, nutrition and sustainable agriculture. “Significant progress has been made, but the gender gap is still large in rural areas and we need to continue to work for policies to have ever-greater impacts on the people’s lives,” explained José Valls, FIRST policy officer in Guatemala. This programme will also support implementation of the recently-adopted Policy for Gender Equality that represents the commitment of the Guatemalan Ministry of Agriculture, Livestock and Food to mainstream gender in all its work.